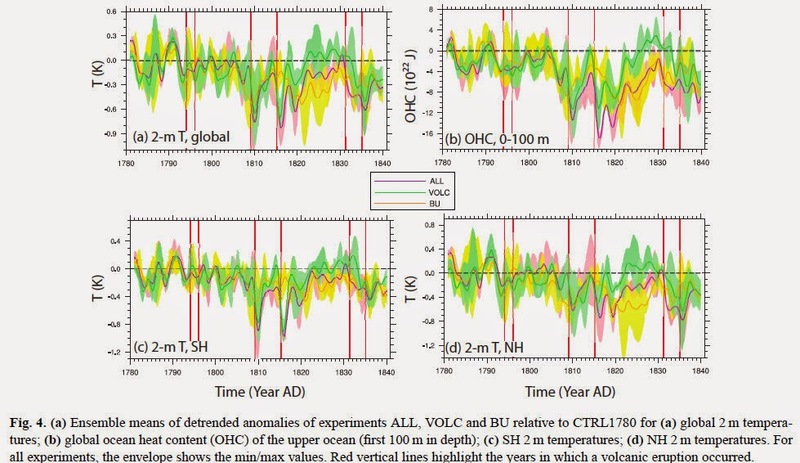 A paper published today in Climate of the Past finds the low solar activity during the Dalton Minimum from 1780-1840 had a significant effect on climate and ocean heat content. According to the authors, "Global and hemispheric mean surface temperatures show a significant dependence on solar irradiance at λ [wavelengths] > 250 nm" and "Reduction of irradiance at λ [wavelengths] > 250 nm leads to a significant (up to 2%) decrease in the ocean heat content (OHC) between 0 and 300 meters in depth, whereas the changes in irradiance at λ [wavelengths] < 250 nm or in energetic particles have virtually no effect." The paper shows a ~16 x 10^22 Joule decrease in global ocean heat content from 0 to 100 meters during the Dalton Minimum, which by way of comparison is 3 times larger than the 5 x 10^22 Joule increase in global ocean heat content 0-100 meters over the past 55 years [Levitus et al 2012, figure 2]. The paper also shows a global surface temperature decrease of ~0.8C during the Dalton Minimum, by way of comparison about the same as the 0.7 - 0.8C global warming since the Little Ice Age ended in ~1850. While many climate scientists claim small changes in solar activity cannot affect climate, this paper and many others demonstrate that these changes do significantly affect ocean heat content and surface temperature to similar or greater magnitudes as found during the 20th century. Global 2 meter temperature in upper left graph dropped ~0.8C during the Dalton Minimum. Ocean Heat Content 0-100 meters in upper right graph dropped ~16 x 10^22 Joules. Abstract. The aim of this work is to elucidate the impact of changes in solar irradiance and energetic particles versus volcanic eruptions on tropospheric global climate during the Dalton Minimum (DM, AD 1780–1840). Separate variations in the (i) solar irradiance in the UV-C with wavelengths λ < 250 nm, (ii) irradiance at wavelengths λ > 250 nm, (iii) in energetic particle spectrum, and (iv) volcanic aerosol forcing were analyzed separately, and (v) in combination, by means of small ensemble calculations using a coupled atmosphere–ocean chemistry–climate model. Global and hemispheric mean surface temperatures show a significant dependence on solar irradiance at λ > 250 nm. Also, powerful volcanic eruptions in 1809, 1815, 1831 and 1835 significantly decreased global mean temperature by up to 0.5 K for 2–3 years after the eruption. However, while the volcanic effect is clearly discernible in the Southern Hemispheric mean temperature, it is less significant in the Northern Hemisphere, partly because the two largest volcanic eruptions occurred in the SH tropics and during seasons when the aerosols were mainly transported southward, partly because of the higher northern internal variability. In the simulation including all forcings, temperatures are in reasonable agreement with the tree ring-based temperature anomalies of the Northern Hemisphere. Interestingly, the model suggests that solar irradiance changes at λ < 250 nm and in energetic particle spectra have only an insignificant impact on the climate during the Dalton Minimum. This downscales the importance of top–down processes (stemming from changes at λ < 250 nm) relative to bottom–up processes (from λ > 250 nm). Reduction of irradiance at λ > 250 nm leads to a significant (up to 2%) decrease in the ocean heat content (OHC) between 0 and 300 m in depth, whereas the changes in irradiance at λ < 250 nm or in energetic particles have virtually no effect. Also, volcanic aerosol yields a very strong response, reducing the OHC of the upper ocean by up to 1.5%. In the simulation with all forcings, the OHC of the uppermost levels recovers after 8–15 years after volcanic eruption, while the solar signal and the different volcanic eruptions dominate the OHC changes in the deeper ocean and prevent its recovery during the DM. Finally, the simulations suggest that the volcanic eruptions during the DM had a significant impact on the precipitation patterns caused by a widening of the Hadley cell and a shift in the intertropical convergence zone. "Reduction of irradiance at λ > 250 nm leads to a significant (up to 2%) decrease in the ocean heat content (OHC) between 0 and 300 m in depth, whereas the changes in irradiance at λ < 250 nm or in energetic particles have virtually no effect." Would it be possible to clarify what this sentence is indicating, please? What, specifically, are "energetic particles," and what is being distinguished as having "virtually no effect"? Thanks!